The 10 Best Museums in Maryland! Maryland is steeped in history and culture. To celebrate that history and culture, we visit museums that preserve art and artifacts, telling us a story from before our time. Whether you are a nature over itching to learn about the Chesapeake Bay or you simply want to observe spectacular art, there are plenty of options for you in Maryland. It’s not easy to narrow this down to just 10, but here are our favorites that will surely delight your friends and family. Port Discovery is a Baltimore Children's Museum. This is one of the best children's museums in the entire country. It is three stories tall and has a wide variety of hands-on exhibits that will thrill children of all ages. Whether your child wants to climb high above the floor in an indoor jungle gym, play with boats and water, pretend to be a cashier, create incredible art, or build the best Lego tower ever—they can do it all at Port Discovery. If you live in Maryland, the chances of you not enjoying boating is incredibly slim. We are a waterman's state and the Chesapeake Bay Maritime Museum celebrates that heritage. In addition to having a collection of artifacts from the Bay and permanent exhibits, they also have vessels for you to explore. However, one of the best things about this museum is that it's on the water and they have events on a regular basis. You can head to the museum for a summertime concert or you can visit for Free Fishing Fridays. The museum provides guests with the equipment and the bait, all free of charge. This is true Maryland heaven. If you love science, this is the place to be. You can get lost exploring their three levels of exhibits or you can spend time in the planetarium and observatory. What’s so excellent about the science center is that it's incredibly interactive. For example, you can go and launch a tennis ball using compressed air. Their memberships are affordable too, so this is a museum you and your family can enjoy. Enjoy Picassos and Matisses up close, marvel at Tiffany, or acquaint yourself with modern artists. Their art docents are spectacularly knowledgeable and happy to conduct tours. Plus, they have a variety of family events. 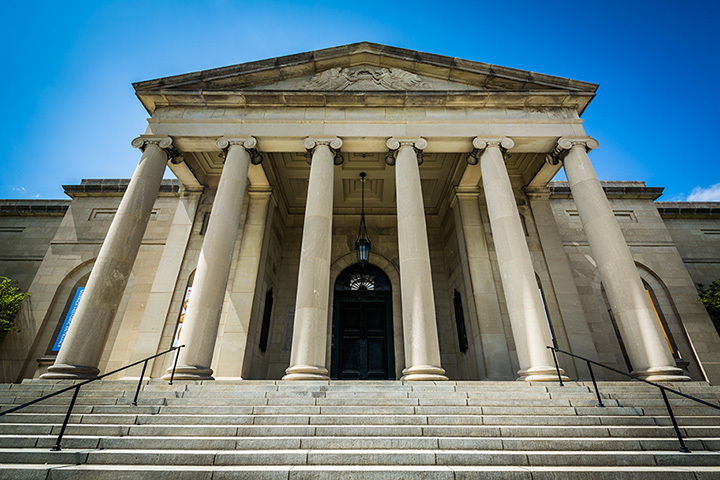 Entrance to the Baltimore Museum of Art is free but you may need to purchase a ticket for specific exhibits. If you love history and the breathtaking architecture of Georgian style plantation houses, Montpelier Mansion is an excellent place to visit. Located in Prince George's County this home was once visited by George Washington. Kids can dress up in colonial-style clothes and play old-fashioned games that the children of George Washington were likely to have played. And let’s not forget about their dinosaur park. Since fossils were discovered on-site, they have created an area where children can dig for dinosaur bones. This is truly a fun adventure for both children and parents alike. The outdoor art surrounding the American Visionary Art Museum is truly breathtaking. Pushing boundaries and challenging your expectations is something that the museum does incredibly well. Thus, even reluctant art lovers will find themselves hard-pressed not to crack a grin while exploring an old bus turned into a mosaic masterpiece or an adult artist’s interpretation of an old-school K’NEX set. Breathtaking and truly spectacular, this is a museum that you don't want to miss. The Banneker-Douglass Museum makes its home in the former Mount Moriah African Methodist Episcopal Church, constructed in 1875. This is where you can go to see African American history in Maryland and the Chesapeake region from 1633 to the Civil Rights movement. They also have fun events that bring history to life, like through their “Jumping the Broom” exhibit. For a collection of aircrafts that include new F-35s head to Pa River Naval Air Museum. They have reserved a rich collection of naval aviation research and artifacts. You can climb inside of planes, helicopters, and jets so this is a truly interactive experience for aviation lovers. Fort McHenry is not your normal museum. This is a national park with a museum within the visitor center. Fort McHenry is a star-shaped fort that was made famous in the War of 1812. It was from the Baltimore Harbor that the “Star-Spangled Banner” was written by Francis Scott Key who was looking toward the fort to see if our flag was still flying. This is a must-see destination for anyone living in or visiting Maryland. You have the benefit of reading about the history and seeing artifacts, and then going outside to walk the fort, see the harbor and experience the things you just learned about. For an unforgettable experience, visit Fort McHenry on the Fourth of July. Huzzah! Railroads are classic Americana. If you head to the B&O Railroad Museum in Baltimore, you can see historic equipment along with different model trains that are set up for specific events. The B&O Railroad Museum has a reputation for having some of the best railroad treasures in the entire world.